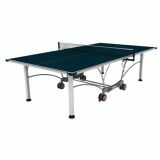 Baja Outdoor Tennis Table has aluminum blue top, heavy duty steel apron, 2" self-opening steel legs, 5" DBL wheels. Oversized caster beam has steel supports, molded corners protect from snags, includes 72" pivoting all-weather net/post system. 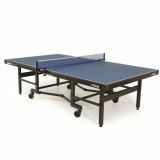 Coronado Outdoor Tennis Table has aluminum blue top, welded steel apron, 1.5" steel legs, 4" casters. Oversized caster beam has steel supports, molded corners protect from snags, includes all-weather net/post system. 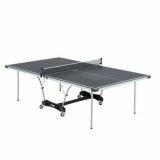 Daytona Tennis Table has 5/8" black top. 1.5" steel support apron & round tube legs. 3" mag wheel casters. 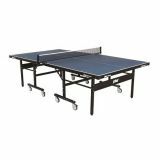 Has built-in ball storage with rigid unibody chassis for added strength. Includes 66" net & posts. 1" top-competition grade. Edgebanding & striping. 2.25" wood support apron. Includes tournament grade net & posts. 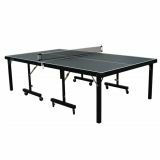 Instaplay Tennis Table has 3/4" black top, 2" steel support apron & 2" square legs. 3" ball-bearing wheel casters. InstaPlay technology - no assembly required. Corner pads protect from snags, includes 66" Net & Posts. 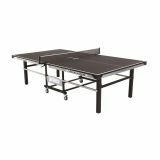 Optimum 30 Tennis Table has massive chassis construction with semi-automatic lock and fold design. Compact storage position (60"W x 30"D x 62"H) with optimum bounce technology. Includes STIGA VM Net & Post Set. 60"Wx68"Dx62"H when open. 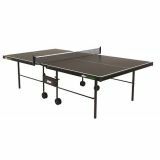 Premium Compact Table is ultimate in design, safety, convenience and world class playability. 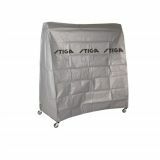 Folds to 60"W x 30"D x 62"H for storage, solid heavy-duty chassis supports thickest top available. Includes Premium VM Net and Post Set. Premium Table Cover helps protect and prevent damage and is shaped and designed to fit most tables. Made of highly durable woven PE material with elastic hems that provide snug and secure fit in vertical storage position. 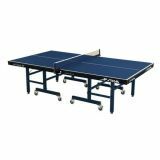 Prince all-weather tennis tables feature Compreg Technology where high-density wood is sealed and allows tables to withstand water. Advantage features 5" horizontal cross bar; 1.5" apron, 1" legs, 4" wheels, heavy-duty net and 2-piece construction. Prince Competitor indoor tennis table features an easy folding frame with 5/8" green top, 2" metal apron, 1-1/2" round legs and 4" wheels. Includes net and posts. 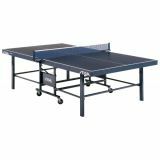 Prince Crusader table is professional grade with solid, heavy-duty one-piece chassis and 1" tournament standard top. Feature 1" black top, 2-3/8" metal apron, 2-3/8" metal square legs, 4" locking wheels and clippers style net and posts. 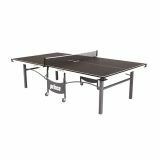 Prince Fusion Pro table features .75" black top, 2" metal apron, 2" legs and 3" locking wheels. Includes net and posts.